Peer-to-peer lending has become increasingly popular in recent years. In fact, the Harvard Business Review named it as one of their “breakout ideas” of 2009. While I’ve long been a skeptic of this sort of thing, I ultimately gave in and decided to find out what all the hype was about. Earlier this spring, I opened an account with Lending Club, and I’ve since started lending out money. Today, I’m going to give a brief overview of Lending Club and provide a walkthrough of the signup process. In a forthcoming article, I’ll actually walk you through the lending process. Lending Club is a social lending network that helps match people who need to borrow money with those that have money to lend. Borrowers with good credit can get loans at better rates than are available from “conventional” funding sources, and lenders enjoy rates that have averaged 9.05% annually over the past 18 months. This beats the heck out of any so-called “high yield” savings account. Keep in mind, however, that your investments are not FDIC insured, so you have to be comfortable with some level of risk. While there are two sides to all peer-to-peer lending transactions, I’m writing from the perspective of a lender, because that’s how I’ve been using Lending Club. Nonetheless, I think it’s worth talking about the requirements for borrowers, as it’s important for prospective lenders to know what they’re getting into. Borrowers must have a credit score of at least 660 based on a credit history spanning at least one year and with at least three accounts listed, two of which must still be open. They can’t have any current delinquencies, recent bankruptcies (past seven years), open tax liens, charge-offs, or collections within the past twelve months. If you’re curious how you stack up, you can take a free peek at your credit score using either FreeCreditReport.com or MyFICO. Beyond the above, borrowers must have debt-to-income a ratio (excluding their mortgage) has to be less than 25% and their credit utilization has to be less than 100%. In other words, they have to fit the profile of a reasonably responsible borrower. Loans are unsecured, and range in size from $1, 000-$35, 000 with a three year term. Lenders invest in “notes” that represent small portions of an individual loan. The minimum investment is $25 per note, so you can really spread your risk around if you wish. You can either select loans yourself or rely on LendingMatch, which creates a portfolio for you based on your desired investment amount(s), interest rates, and risk profile. Each month, as the payments are received from borrowers, Lending Club deposits the principal and interest back into your account (after deducting a small fee). You can either withdraw these funds or reinvest them in additional notes. While the loans themselves are not insured, your uninvested cash balance is covered by FDIC insurance. Note that there are some state residency and income requirements for investors. 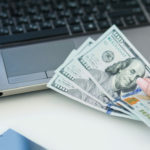 As of right now, individuals in 25 states can invest in notes, though Lending Club has applied for approval in all remaining states, and is adding them in on an ongoing basis. As for the income requirements, I’ve heard through the grapevine that these aren’t really enforced, so you shouldn’t run into any problems. If you don’t live in an approved state, you can still open an account and buy/sell notes on the secondary market using the Lending Club note trading platform. Opening a Lending Club account is a very easy, three-step process. Step 1: Set up your login credentials. Simply visit Lending Club, enter your e-mail address and desired username, and click the “signup” button. From there, you’ll set up your password, security question, etc. 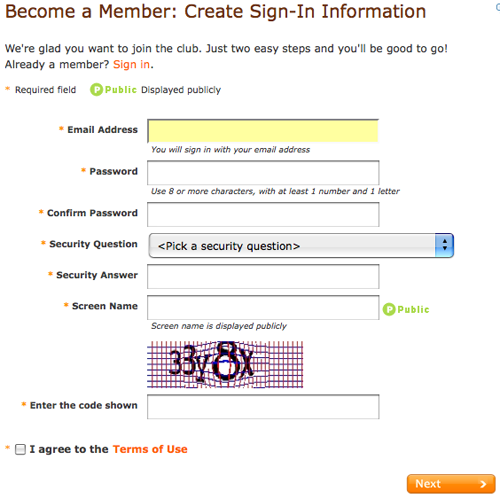 Step 2: Enter your name and contact information. 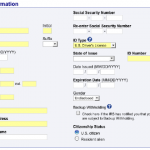 On the next page, you’ll enter your name, social security number, birthday, address, and other contact information. 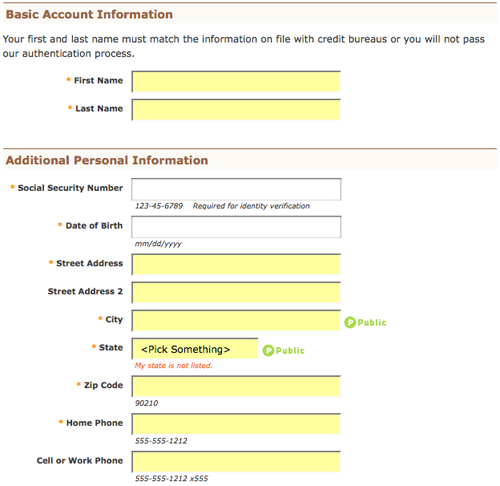 Step 3: Enter your bank account information (optional). This step is only necessary if you want to be able to transfer funds directly between you bank and Lending Club. I want to be able to do this, so I went through the process. After that, keep an eye on your bank account. Lending Club will initiate a small debit (less than $1). Once you verify this amount, your bank account will be linked up and ready for transfers. I think Lending Club’s verification is sketchy (for borrowers), and after reading some of these reviews I really believe it. I have a great credit score, no delinquincies, 15% debt to income, etc., but was still denied. What a pain. Feels like an empty promise. I just wanted to get away from a high interest card, but no go. Also, I was a potential investor, but am a little turned off now. i applied for a debt cons loan last week. i received an email today that i was removed from the listing because they were unable to identify my phone number. i dont even get any calls from the club. how come they were unable to verify me. this is the first time i experienced that. its very unreasonable. i even added 2 phone numbers for them to contact me? i thoughy they are there to help…. I tried to call and sent them emails numerous times( have the emails to prove it) to only get a voice mail and no response to my email’s! Like ED, they later sent me an email stating my income could not be verified… One would think that a credit score of 720 with a great repayment history along with good income would drive a return call from Lending Club. Having just gone through opening an account with Lending Club, I have one complaint. It wasn’t until after I funded the account (paypal) that I was notified by the website that my New Mexico residency limited me to the secondary market on foliofn. Now maybe I missed that buried within the boiler plate, but I thought I gave it a more than cursory review. I do see that there are loan participations available to me close to (or even slightly below!) par. But I would have appreciated knowing up front that my residency prohibited me from participating in originations. What do you think? Can you borrow money to become a lender? Just curious. I understood your complaint: you believed that you had the loan in hand (once it had been funded by lenders) but then it was taken away from you. You believe it is a waste of your time as well as the time needed for LC to process the loan. I think you didn’t understand my comment. Your actions of applying for other loans (you said you turned down other options during the week period of LC) when trying to finalize a Lending Club loan may have made you look too risky to be a borrower and that could be why you were then told you no longer qualified. When buying a house or refinancing a mortgage, the advice is always the same: don’t make any big purchases or open any credit lines during the process. It sets off red flags to the lender. I’m not sure if this is the reason you were rejected after you had been ‘approved’ unless LC confirms this, but I don’t think it helps. I’m sorry you had a bad experience, and I hope you’re able to find another alternative for your loan. Thanks MG for your two cents…I was never upset over the fact as you put I was a “bad risk”. I simply did not have much credit history as all credit is in my spouses’ name. I was merely, trying to maintain a loan with myself as the primary. Nonetheless, you have failed to understand my previous complaint ,as paperwork had been signed, employment verified, paystub faxed, etc. just to be told I no longer qualified, when I was told I did at first. My concern was that this was a lot of work and time spent by myself and the Lending Club for them to determine I did not have enough credit history. My complaint is that they could have stood to let me know sooner then 6 days into the process. Maybe your in put next time will be about the process then focusing on my credit history. You may want to consider that you seeking and rejecting other offers for loans “in the past few days” as you state made you seem like a bad risk and that’s why you were then disqualified. If you have a mortgage or have ever refinanced, this is the same reason why the bank always says not to make any large financial moves before the paperwork has been processed. It makes your financial situation look in turmoil. I too had a similar recent experience with the Lending Club, after registering with their web site last Friday, 8/7/09, I was told I met the qualifications to get a loan for up to $12,000. I decided to apply for $10,500. After several days of checking my funding status, I was told I qualified for only $4,025. I accepted their counter-offer, provided the requested documentation in good faith provided them with my bank account information to begin the bank draft for repayment. Today I received notification that I was no longer qualified and will no longer be considered. This is a very poor process and not only a gross waste of my time, but the company’s time as well. Couldn’t The Lending Club have been a little more honest with me? My advice is that they be more up front with borrowers. I turned down other options in the past few days because I was interested in the loan rate and what they were doing for others, I found it innovative and wanted to be a part of it. I am very disappointed with how I have been treated and unfortunately would not recommend the Lending Club to anyone – over a week since I registered for funding and then I get told I didn’t even qualify. Mislead and then decline?! From an operations standpoint this cannot be a very efficient use of time. Think of all of the people who were “qualified” and had over 40 lenders waste their time on profiles only to learn that they did not meet the credit “criteria”? I have received an explanation as to the mix up. Mr Kinney (Risk) had phoned me about a week ago in order to verify some information. When I returned his call the next day, his computer was on the blink and we agreed I would call him back. When I did, I received a voice mail, at which time I left a message. Later that day, I called again, could not get a hold of him, but did speak to another rep. Mr Kinney’s system had apparently listed me as contacted and he didn’t attempt to contact me any further. The problem, as it turns out, was that he was attempting to verify my company in MA where I live, instead of RI where the business is located. When he could not find a business registered there… I was delisted. Stuff happens… We have since relisted and I’ve sent doc’s and taxes etc. One thing I would point out is that there doesn’t seem to be a method for allowing lenders any insight into what has happened. It just looks like a relisted loan that perhaps wasn’t funded for negative reasons… I went in and posted a question to myself, as a way to explain the problem. Hopefully alls well that ends well and the initial 47 lenders were not put off too much. I am sorry to hear your experience was not superb. I have asked the customer service and credit teams to look into your case and get in contact with you to resolve any open issues asap. In general, loans are only removed when the borrower cancels the loan listing OR when our credit team cancels it following additional credit review (insufficient proof of income, credit quality, inability to verify employment, etc). We strive to address these issues with the borrowers but see ourselves forced to de list the loan to protect the investors when they are not. We’ll be delighted to reinstate your loan request for investors to fund it if we can work out the open questions. Ed: I can’t comment on your specific situation, but from a borrower’s perspective, I’ve seen a number of loans get “de-listed”. They seem to list loans before they’ve completed the verification stage and then pull them if there’s trouble. This is kind of annoying for lenders, but it’s good for borrowers that ultimately get funded, as they get their money more quickly than if LC held their loan off the market until everything was completely verified. I don’t want to leave the borrowers experiences out of the conversation. They are afterall, a necessary component. Ed’s experience is wierd… I ‘ve been trying to find anything that lending club has ever said about borrower’s employers or self employed criteria. I’ve found nothing. I also couldn’t find anything about what methods the’re using to verify info… are they relying on transunions info solely & blindly? That would be a mistake in my opinion. That has been a real bank problem in trying to lower underwriting costs. I thought we were attempting to lend differently. Databases should be used as initial guidance systems, not security blankets. But if he is correct, there isn’t any info about his company / employer on TU anyway? So, why don’t they explain what occurred? Ed’s situation can work against lenders. Everyone needs to trust in the integrity of their system. Business owners information is easily verified, but it sounds like noone’s really checking other than whatever sloppiness they’re seeing on Transunion, or LC is just not as transparent as they claim. I just signed up as a potential lender and borrower. After 13 days on the list of loans they pulled the listing. They sent an email stating that I was declined and that my “employer didnâ€™t fit their criteria”â€¦?? Anyone ever heard of that? 47 people had funded the loan to that point. Everything looked good and then from nowhereâ€¦ My Employer??? I am SELF EMPLOYED in coffee retail and wholesale for 8 years. Sales up every year. I have good income and ten employees, We are in good standing, no debtâ€¦ ? No explanation. I have seen other self employed folks and other employed folks, get loans with a lot less than my stable background. Credit was good, no delinquentsâ€¦ whats that about employer? There is no transunion info on my company, so Iâ€™m out without the heralded transparency. By the way they stated that the listing expired on the web page. In fact they pulled it early. As a potential lender I wouldnâ€™t mind knowing if theyâ€™ve got thier own arbitrary system and criteria for “employers”. Thanks for waiting 13 days, holding up 47 people’s money, just to get it wrong. My employer does in fact fit their criteria, I know him well. Somethings wrong with this picture. Great review, Nickel. I fully recommend Lending Club. Like Dan, I’m also a lender in both Prosper and Lending Club from the beginning. I fell in love with the concepts and I tell you, Lending Club is the clear winner. Prosper’s default skyrocketed after their 1.5 yrs operating because they let anybody in and did not do any credit review. Lending Club, on the other hand, is very exclusive and is doing a hell of a job keeping only good borrowers in the inventory. Sometimes I complain they don’t have anough for me to pick from, but I know it’s for the lender’s benefit. They just pushed a way to measure your ROI and I have a beautiful 8.34% after losses and fees in my account summary. With Prosper, I think I’m close to 3%, not bad, but not worth it. 1) The current data (data, not funds) act like a ponzi scheme in that a constant stream of new loan originations dilutes the weight of a single defaulted loan. Prosper has shown that loan performance degrades over time (at the very least, most loans make a few payments before they go bad.) Given that Lending Club is younger than Prosper and has stricter lending requirements, it doesn’t surprise me that the returns are as high as they are. But I don’t expect them to be sustainable. 2) There are significant structural changes that have occurred at Prosper. Therefore, the “overall” rate reflects a state of Prosper that no longer exists. If one assumes the changes are for the better, then one can expect *better* than reported returns. In fact, Prosper has sometimes reported “data since Feb 2007” when significant credit reporting changes were made. However, that also skews the age average age of the platform down (younger) meaning that it needs more time to mature. 3) You simply can’t cash out your returns so they really do exist only on paper. At least with my securities accounts, I can cash out my funds for whatever they’re worth at the end of the business day and stick them in a stable value fund. The bottom line is that the P2P market has some maturing to do before we fully understand the eventual returns. As with all loans, if they are used, they should be understood as a means to a specific end, and that end should improve their overall financial health. IN other words, don’t take out loans to fulfill any discretionary costs. Instead, trim those from a budget. After Prosper’s demise (and eventual current re-emergance from hibernation), I’ve looked to alternatives like Lending Club, which seems to be the most reputable of the bunch. My only concern is the current economy and whether these high-risk loans are more and more prone to defaults. I’ve seen an increase on defaults in my Prosper account, and it seems the current sentiment out there is that it’s happening accross the board. All part of the risk-reward game, of course…it may still be a great investment for a sufficient reward.